Ivan James (#10) runs down Tlc Dale in the $194,810 Firecracker Derby Friday night at Delta Downs. 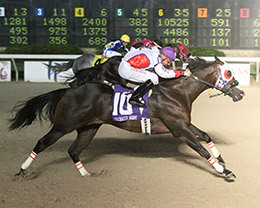 VINTON, LA�JULY 1, 2016�Graded stakes winner Ivan James rallied to defeat Tlc Dale by a neck Friday night in the $194,810 Firecracker Derby at Delta Downs. Shez A Hot Valentine finished half-a-length back in the show position. Ridden by jockey Raul Ramirez, Jr., Ivan James completed the 400 yards in a quick :19.352 seconds to earn a 103-speed index. Trainer Elpidio Luna, Jr. saddled the son of multiple stakes sire IVORY JAMES to his fourth win in eight career starts. A Texas home-bred for owner/breeder Jorge Meraz, Ivan James picked up $97,405 for the Firecracker win to become his sire's leading money earner with $395,817 in the bank. Last year's Sam Houston Futurity(G2) winner is out of the Dashin Bye mare First Dashin Bye. He was also third in Grade 2 Firecracker Futurity at 2. Tlc Dale came into the June 10th Firecracker Derby trials off a win in the Grade 3 $191,000 Sam Houston Derby. The bay gelding was the Firecracker Derby fastest qualifier. He dueled early in the final just missing to settle for a second place payoff worth $33,118. A homebred for owner Rogelio Garza Tlc Dale is trained by Adrian Huitron with Manuel Gutierrez getting the riding assignment aboard the $130,235 money earner. Also a stakes winner, Shez A Hot Valentine races for owner Jaime Flores and trainer Homar Garza. Ron Hanna bred the filly in California. Ridden by John Hamilton, the gray filly earned $19,481 to boost her career total to $98,228. First Fancy Prize, Brave Heart Won, Slick Melody, Not Perry Pretty, King Brett, Ricky Rockstar and Mr Joe Perry completed the field.